The USB copy button (only available on the MyCloud Duo and the MyCloud Pro) allows you to quickly back up data from an external USB storage device such as a USB hard drive, USB flash drive or USB card reader. When a USB drive is connected to your network drive via USB, all files on the USB drive can be copied to the internal hard drive of the network drive with a push on a single button. Follow the steps below to complete USB Copy. Connect the USB drive to the front port of your network drive. We recommend using self-powered USB devices. Press the Copy button for one second to copy all the files from the attached USB drive to the Public folder on the network drive. During the backup, the system LED is flashing green. A new folder starting with UPLOAD and the current date plus time is automatically created and all files from the USB drive will be copied into it. When the backup is done, the USB drive will be ejected automatically. 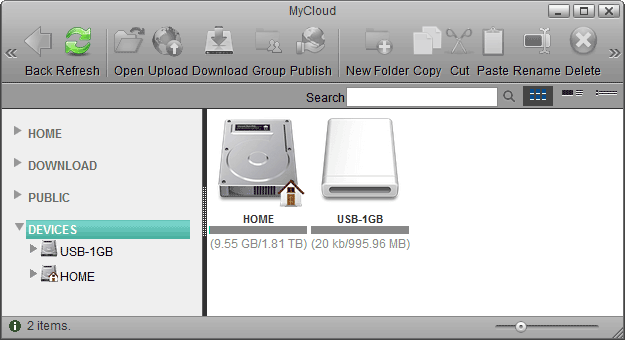 The USB drive can now be removed and the backup data can be accessed on the network drive. To safely remove the USB drive without doing a backup, go to the Disk Manager, select the external USB drive and click Remove in order to eject the drive. The maximum HDD capacity that is supported is 2TB and the maximum file size (total file size) is 32GB. The USB copy function only works for the USB port on the front of the network drive. This is the port right beneath or beside the USB copy button. USB drives which use a firmware that has support for 4K sectors enabled are not supported! 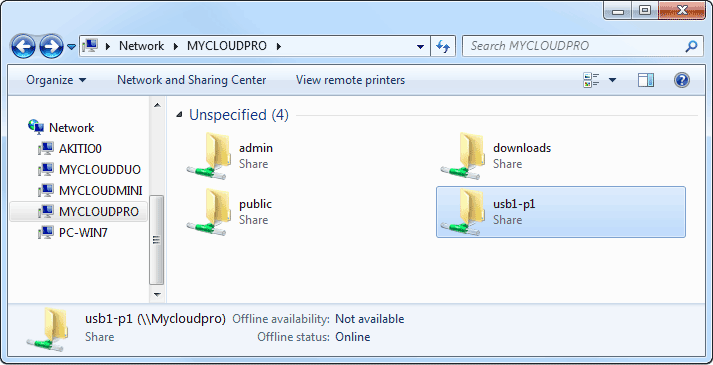 If your MyCloud does not have a USB copy button, you can also access and backup the data on the attached USB drives manually. It does not matter if you use the front ports or the USB ports at the back of your device. Connect the USB drive to the USB port on your network drive and turn on the power. Open the web browser and login as administrator (admin). You can now access the data on the USB drive under DEVICES. If USB bus power is insufficient to power up the hard drive, please connect an external power adapter to your USB drive. Instead of using the web browser to access your data, you can also mount the network drive via SMB (Samba) or AFP. Use SMB on the PC and AFP on the Mac. 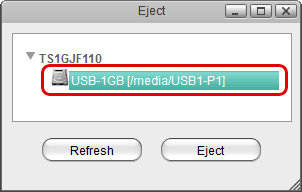 The data on the USB drive can be found inside the usb-p1 or usb-p2 folder. Only the administrator (admin) can see and access the USB drive. If you want to share the data with other users, copy the files to the PUBLIC folder on your network drive or use the Share function in the web interface. Select an existing folder or create a new folder on the USB drive, right-click on it, select Share, select Group and then set up your preferred user access. USB drives with capacities over 2TB are not supported! USB drives cannot be seen or accessed when using FTP! Following file systems are supported by the network drive. 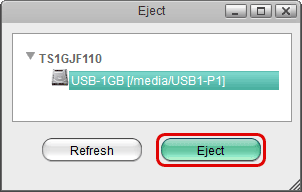 To safely remove an attached USB drive, please eject it first, before you disconnect or turn off the drive. Click on the eject icon in the taskbar. Select the USB drive that you would like to remove from the list of available drives. You can now disconnect or turn off the USB drive. When using the USB copy button, the drive is ejected automatically after the backup is completed. Simply disconnect the drive. 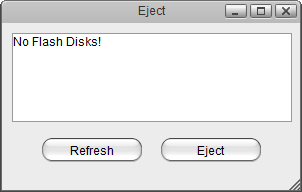 If you have setup your USB drive as the HOME partition for this system, please DO NOT eject or remove the USB drive. The file transfer rate when copying files back and forth between the network drive and the USB drive varies greatly, depending on how the files are transferred and where the USB drive is connected to. The best way to manage your data on the USB drive is, when the USB drive is attached to your computer and the network drive is mounted to that computer through Samba. No matter if you are uploading files (USB to NAS) or downloading files (NAS to USB), this method gives you the best results. 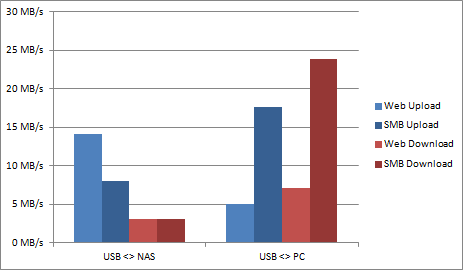 The following benchmark, tested on a MyCloud Mini with firmware version 20121220, shows the different transfer rates clearly. USB <> NAS The USB drive is connected to the network drive. USB <> PC The USB drive is connected to the computer. Web Upload The files are copied through the web interface from the USB drive to the network drive. SMB Upload The files are copied through Samba from the USB drive to the network drive. Web Download The files are copied through the web interface from the network drive to the USB drive. SMB Download The files are copied through Samba from the network drive to the USB drive. For this test, the USB hard drive was formatted using the NTFS file system. Transfer rates for FAT32 will be a bit faster, especially when copying the files from the network drive to the attached USB drive. For more information about the web interface, please see File Management > Web Interface. For more information about how to mount the network drive using Samba, please see File Management > Samba for PC users.